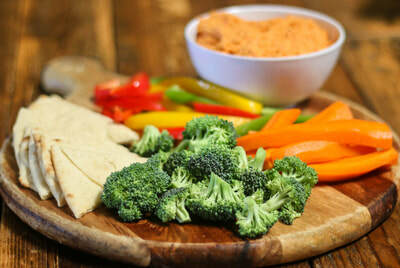 Roasted Red Pepper Hummus with Fresh Veggies & Pita. Side Salad Fresh Spring Greens, Carrot, Radish, Cucumber & Croutons. Caesar Shaved Parmesan, Romaine Lettuce, Tomato & Croutons with House Made Caesar dressing. Aged White Cheddar, Candied Pecans & Golden Raisins. 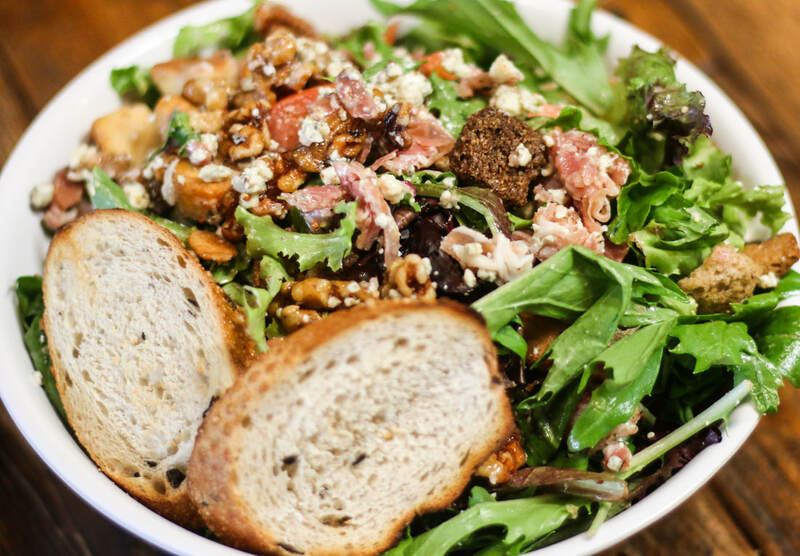 Cobb Fresh Baby Greens, Tomato, Shaved Carrot, Broccoli, Bacon, Blue cheese, Avocado & Croutons. ***Served with house made buttermilk ranch or lemon & herb vinaigrette. Three Cheese Chevre goat cheese, Saint Andre Triple Cream Brie & Blue Cheese, Roasted garlic, Lemon Dressed Arugula. Salami Smoked Tomato Jam, Sopresatta, New York White Cheddar, Aged Balsamic & Lemon Dressed Arugula. Bacon & Blue Red Onion Jam, Apple Wood Smoked Bacon, Shafts Aged Blue Cheese & Lemon Dressed Arugula. Comes with house made pickles and choice of potato salad or kettle chips. mayonnaise, olive oil, red wine vinegar, salt & pepper. Add pepperoncinis or jalapenos, apple wood smoked bacon, prosciutto or avocado. Club Oven Roasted and Deli Sliced Chicken, Porchetta, Apple wood Smoked Bacon, Avocado & White Cheddar. Italian Sopresatta, Porchetta & Aged Swiss. 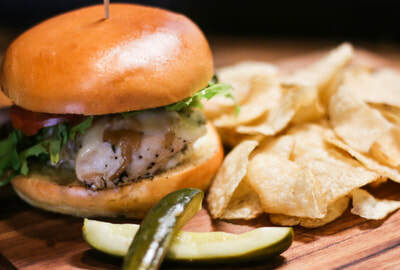 ​Chicken Ranch Herb & Garlic Marinated Chicken Breast, Aged New York Aged White Cheddar & House Made Ranch. Chicken Caesar Herb & Garlic Marinated Chicken Breast, House Made Caesar Dressing, Shaved Parmesan. Served with house made pickles and kettle cooked chips or potato salad. Upgrade to Tomato Basil Soup, or a Side Salad. tomato. Served on a torpedo roll. Sausage Sandwich_ Grilled Bratwurst, Spicy Andouille or Smoked Kielbasa Sausage. Served on a freshly baked sourdough sausage roll with house mustard and grilled onions. Grilled Chicken Herb & garlic marinated chicken breast, Swiss cheese, garlic aioli, grilled onions, lettuce & tomato. Served on a toasted brioche bun. Spicy Chicken Sandwich marinated chicken breast, grilled Serrano peppers, white cheddar cheese, chipotle aioli, fresh spring greens & tomato. 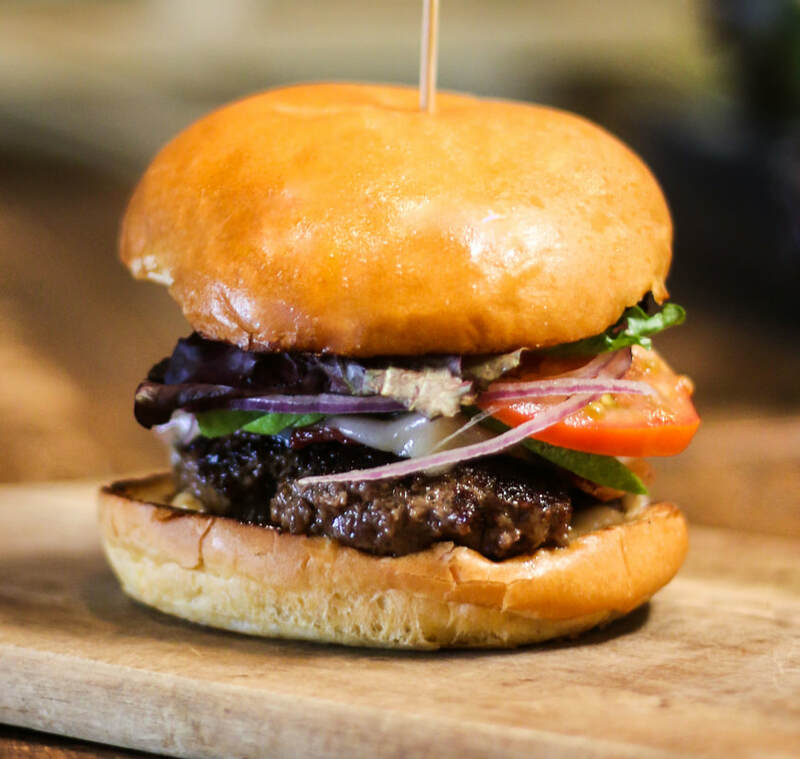 Served on a toasted brioche bun. Teriyaki Chicken Sandwich Grilled chicken breast, teriyaki sauce, jack cheese, lettuce & tomato. Served on a toasted torpedo roll. Pulled Pork Sandwich Roasted pulled pork, grilled onions, house made BBQ sauce, fresh spring greens & tomato. Served on a toasted brioche bun. Choice of Ciabatta Bread or Herb Crusted Foccacia. ​Brie Saint Andre Triple Cream Brie, Bacon & Honey. 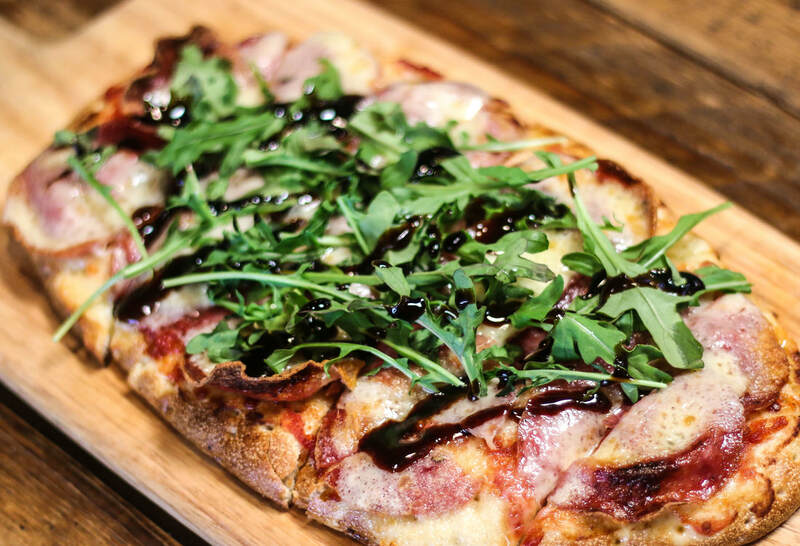 Blue Cheese Blue Cheese, Prosciutto, Caramelized Onions, Smoked Tomato Jam, Arugula & Aged Balsamic Vinegar. Roast Pork Hickory Smoked Pulled Pork, Caramelized Onions, Aged White Cheddar, Smoked Tomato Jam & Arugula. Grilled Zucchini Grilled zucchini, Fire Roasted Red Bell Pepper, Red Dragon Cheddar, Smoked Tomato Jam & Arugula. Roasted Chicken Oven Roasted & Deli Sliced Chicken, Bacon, Herb Pesto Aioli, Gruyere, Smoked Tomato Jam. Grilled Cheese Gruyere, White Cheddar & Saint Andre Triple Cream Brie. Platters prepared for larger groups. Please order 2 hours in advance of dining time or pickup. Served on assorted bread with kettle chips and Potato Salad. 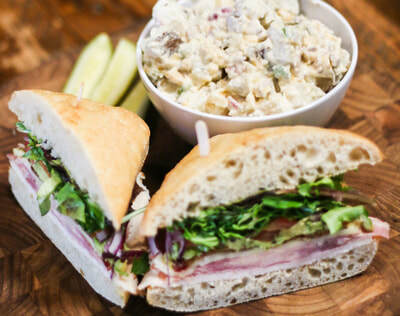 ​Club: Oven Roasted and Deli Sliced Chicken, Porchetta, Apple wood Smoked Bacon, Avocado & White Cheddar. Italian: Sopresatta, Porchetta & Aged Swiss. Spicy Italian: Spicy Capicola, Spicy Coppa, Porchetta & Aged Swiss. Ham: Porchetta, Apple Wood Smoked Bacon & Aged Swiss. Chicken Ranch: Herb & Garlic Marinated Chicken Breast, Aged New York Aged White Cheddar & House Made Ranch. Chicken Caesar: Herb & Garlic Marinated Chicken Breast, House Made Caesar Dressing, Shaved Parmesan. Chicken, Bacon & Avocado: Herb & Garlic Marinated Chicken Breast, Bacon & Aged Swiss. Brie: Saint Andre Triple Cream Brie, Bacon & Honey. Blue Cheese: Blue Cheese, Prosciutto, Caramelized Onions, Smoked Tomato Jam, Arugula & Aged Balsamic Vinegar. Pulled Pork: Hickory Smoked Pulled Pork, Caramelized Onions, Aged White Cheddar, Smoked Tomato Jam & Arugula. Grilled Zucchini: Grilled zucchini, Fire Roasted Red Bell Pepper, Red Dragon Cheddar, Smoked Tomato Jam & Arugula. Roasted Chicken: Oven Roasted & Deli Sliced Chicken, Bacon, Herb Pesto Aioli, Gruyere, Smoked Tomato Jam. Grilled Cheese: Gruyere, White Cheddar & Saint Andre Triple Cream Brie.